When it comes to working with digital spreadsheets and worksheets, nothing in this living and breathing universe beats the versatility and flexibility that Microsoft Excel has to offer. Ever since its conception, for the last 30 years, it has been standing as one of the pioneering official tools, innovating itself with each new iteration. Excel 2019, which is the latest and possibly the greatest Excel version up until now, is fully ripe and fleshed out with new contents which both interesting for advanced users, and easy to understand for beginners. A very common question that often plagues the minds of first time learners of this software is that what are they going to do with it? This is a very ambiguous question as whether you will be able to succeed in life using the new software which you have learned, will completely depend on how you plan to utilize your time. But I can certainly guarantee you that not even a single second of your precious time will go in vain if you learn Excel 2018 properly. Excel is an industry leading software, person who are skilled and adept in Excel are always high in demand in the job market and it will surely help you to get a competitive edge over the crowd. Regardless of the fact of you being a pro user or an absolute beginner in Microsoft Excel, this book is aimed to help you learn the basics as well as the advanced function such as Quick Analysis Tool, Charts, Pivot Tables and Syntaxes. I encourage you to begin your journey with Excel 2016 knowing that you are about to learn one of the strongest data-processing and analysis software on this planet. For more information click on the BUY BUTTON!! 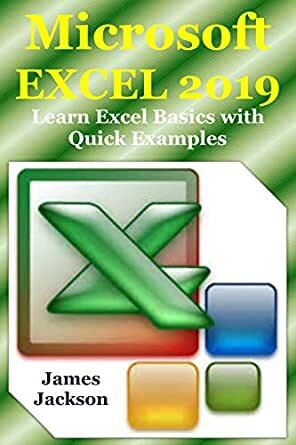 This book really helps beginners learn the Microsoft Excel 2019. I like the Training book with many Exercises instructions and details. Easy to.follow and understand. I'm looking forward to learning more about it. 5.0 out of 5 starsRecommended! Very informative and learning read this book. I really like it and follow it. Recommend! This book is very good book.This book providing proven and well recommended.